Looking for a delicious refreshing popsicle recipe to rescue you from this summer heat? Try these nutritious strawberry, coconut, cherry popsicles! They are delicious and do not take long to prepare, the hardest part is resisting the temptation to eat them while waiting for them to freeze fully. There are only two layers to the popsicle, the strawberry layer and the coconut layer. Then we threw in some sliced cherries to add some additional health benefits and delicious flavour, as well as to create some contrast with the colors. Besides the delicious flavour of strawberries, these berries also have a lot of nutritional benefits. First of all they contain anthocyanins, a type of flavonoid that is responsible for the beautiful color of strawberries and is also a type of antioxidant. Another flavonoid and antioxidant, quercetin, is found in strawberries and is known for its anti-inflammatory properties. Strawberries are also a good source of fiber and potassium which are both important nutrients for heart health. They have a low glycemic index making them a wonderful sweet berry that won’t impact blood sugar as much as other fruits do. Strawberries are a good low-sugar snack that we recommend for anyone that has Type 1 or Type 2 diabetes or if you’re following a low-sugar diet or even the candida diet (if you are not strictly eliminating all berries). Lastly, strawberries taste delicious and are easy to incorporate into your diet. They can be added to salads, smoothies, popsicles, or enjoyed on their own with a little squeeze of lemon juice (a simple and yet delicious combo). Cherries have a delicious tart yet sweet flavour as well as many health benefits. Cherries are an excellent source of vitamin C and antioxidants. Cherries, like strawberries, have a low glycemic index so they won’t spike your blood sugar level in the way that sugary desserts do. 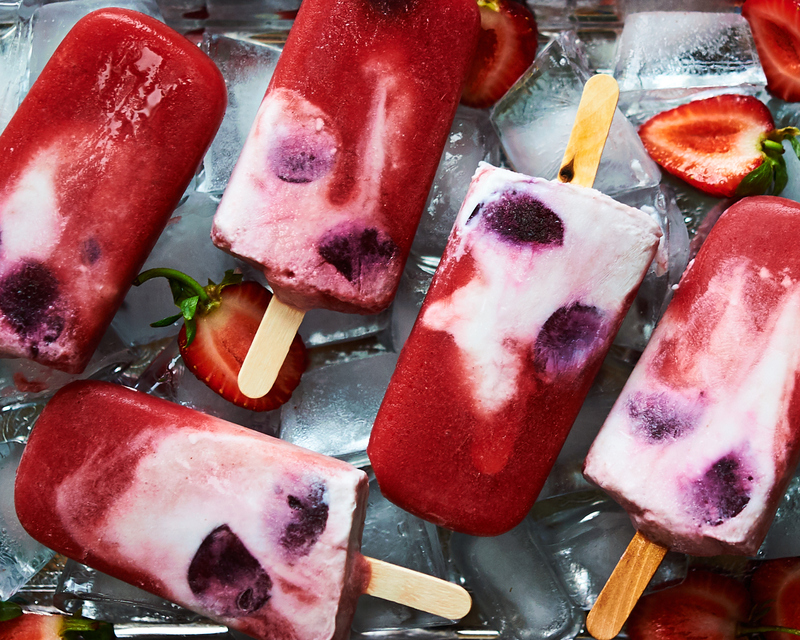 We hope you will give these delicious popsicles a try during the summer- it’s such a lovely recipe because it’s sweetened with low-glycemic fruits and can be made completely sugar free by using monkfruit sweetener instead of maple syrup or honey. Alternatively, you could even omit sweetener all together and simply use fruit and coconut milk. These popsicles are also vegan and dairy free, making them friendly for everyone. We promise you won’t regret it! Whisk together the coconut milk with sweetener of choice in a bowl. Blend the strawberries and lemon juice in a high-speed blender until smooth and liquid. Slice the cherries in thin pieces (you’ll need to remove the pits). Pour the strawberry liquid into 6 popsicle molds, filling them ½ way. Then pour in the coconut milk over top of the strawberry liquid (it will mix in slightly with the strawberry liquid). Place some slices of cherries into each popsicle mold. Place the popsicles in the freezer for 1 hour. Then carefully stick wooden sticks into each popsicle. Place back in the freezer and freeze for 3-4 hours, until solidified completely.